Prateek Explosionproof commitment to meeting rapidly changing customer demand can only be achieved by maintaining very high standards in all aspects of our business. 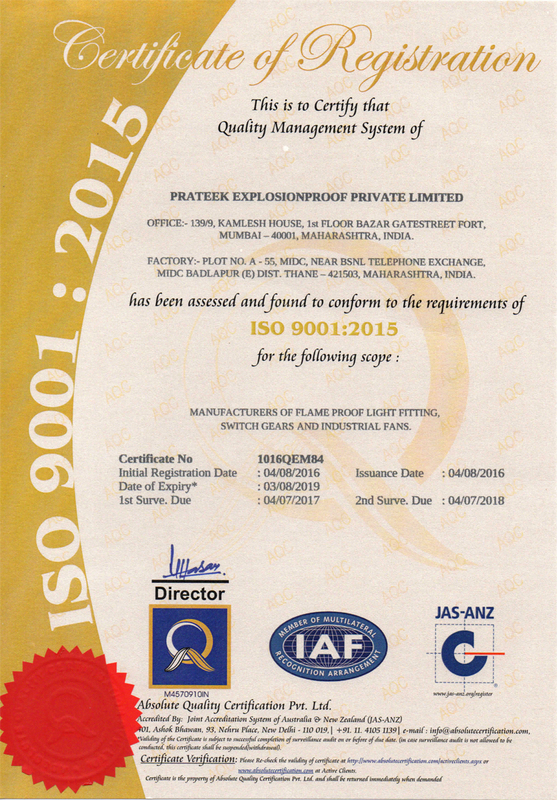 Manufacturing automation, well qualified and motivated work force has helped Prateek Explosionproof provide a comprehensive, reliable and customer oriented quality management system. Prateek Explosionproof well thought out logistics, production and JIT delivery is the basis of all round success. To keep up with the new standards and technical demands is our constant challenge. Prateek Explosionproof is operating from its registered office at Mumbai in India. It's nation wide network of representatives and dealers ensures an easy accessibility for customers. The company's manufacturing set up at Ambernath-Thane has the state-of-the-art infrastructure & manufacturing technology which ensures manufacture of products to the latest international standards keeping in mind the rapidly changing customer demand. The total plant area of about 3000 sq.mts, provides an excellent space to carry out all the required functions in compliance of Quality System Standards. With the dedicated team of about 50 employees, our Ambernath-Thane works has been able to cater most demanding situations. The inspections being carried out at every level of process makes it possible to have the complete control of quality and provide the customers with the best products.